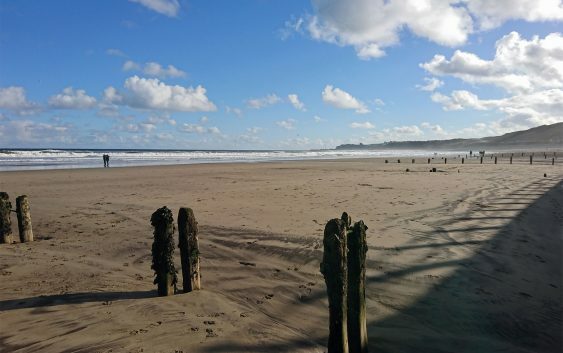 This is a popular beach walk from Whitby to the nearby village of Sandsend, along a flat sandy beach. The route is part of the Cleveland Way, although technically this follows the top of West Cliff and the A174 to Sandsend. The beach is a much better option, unless it’s a particularly high tide. The long, wide beach is ideal for a dog walk, plenty of room for dogs to run around. The walk from the West Pier in Whitby to the cliffs at Sandsend and then back is about 4 and a half miles. Parts of the beach do get cut off at high tide so check the tide times at UK Tide Times when planning your walk. The whole length of beach is dog-friendly from 1 October to 30 April. There are two dog bans at Whitby and Sandsend during the summer months. Avoid the banned area, by an easy detour along the cliff top at Whitby or the roadside footpath at Sandsend. If you are walking out of season (or don’t have a dog) leave Whitby at the West Pier, dropping down to the beach. 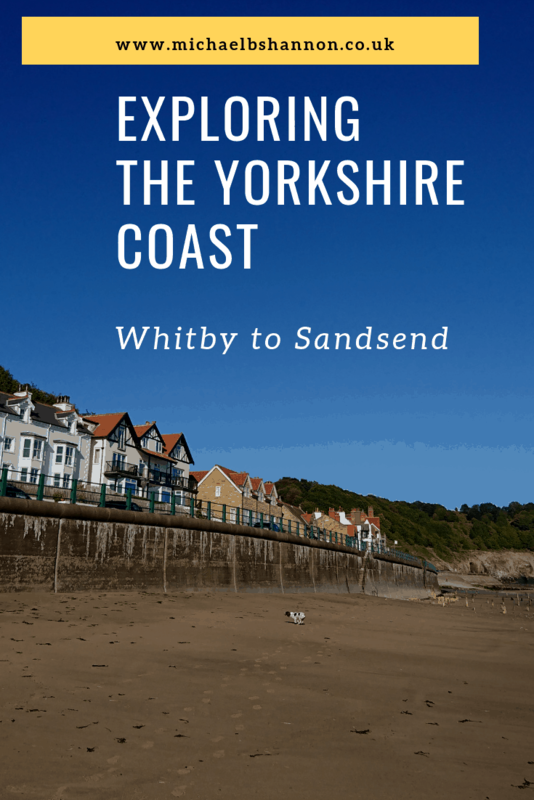 The route then heads out across Whitby Sands, past the Golf Club and Upgang Beach, and arrives at Sandsend Beach. Jutting out of the sand at Sandsend is the wooden skeleton of an old jetty, the subject of many photographs. Walking past Sandsend, the walk ends at the cliffs, which form a natural barrier at the end of the beach. Sandend is a very picturesque village with Victorian houses and attractive cottages (East Row). The pretty fishing village includes a nice beach and lots of attractive cottages. Behind Sandsend is the wooded Mulgrave Estate, which is open Saturday, Sunday and Wednesday. This is a great place to extend the walk. There are miles of peaceful woodland trails taking you to becks, waterfalls and the interesting ruins of Mulgrave Castle. You could also continue along the Cleveland Way and visit Kettleness and Runswick Bay if you are feeling energetic. Walk off the beach to the car park near the cliffs. Then look for the Cleveland Way signpost and the obvious track up the cliff side. Runswick Bay is another lovely fishing village with a sandy beach, sheltered bay and picturesque cottages. You could always turn this into a linear walk, the x4 bus is a regular service from Whitby to Middlesbrough, which calls at Runswick Bay and Sandsend. If you are arriving by car, a possible alternative would be to walk the other way, Sandsend to Whitby and back. In winter this will save any car parking charges. The carpark at Sandsend is free in the winter months. If you are returning along the beach to Whitby, fantastic views of Whitby Abbey and the West Pier are in sight all the way back. To avoid Whitby Beach when the dog ban is in force. Firstly, walk up the Khyber Pass to the Whalebones next to the statue of Captain Cook at the top of the West Cliff. Then walk along the cliff top until you have passed the Pavillion Theatre. Finally, descend back down to the beach huts, promenade and beach. The area covered by the dog ban is clearly marked. Beach Level view of Whitby West Pier. Whitby to Sandsend - beach view half way point. Cliffs at the end of Sandsend Beach. Cliff top view of Sandsend Beach looking towards Whitby. Cliff top view of Sandsend Beach.